My heart is broken! Okay, so I might be a little over dramatic but the plain fact is that George Price Boyce got married. Sob! As you will know, I have done blog posts on both George Price Boyce (here) and his sister Joanna Wells (here). 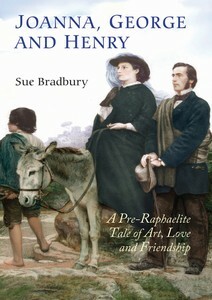 The 'Henry' of the title is Joanna's husband and George's friend, fellow artist Henry Wells, and this is a book about their shared life and what became of three talented painters on the fringes of the Pre-Raphaelite circle. Do you see the house with no walls and roof left? 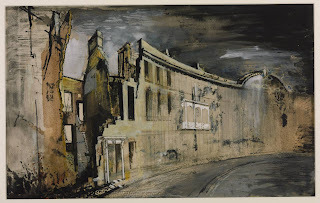 That was No.42, the home of Alice Street, 82 years old and daughter of Henry Wells and Joanna Boyce, and the house contained a vast collection of her parents work, together with early work by Burne-Jones, and a Madox Brown. 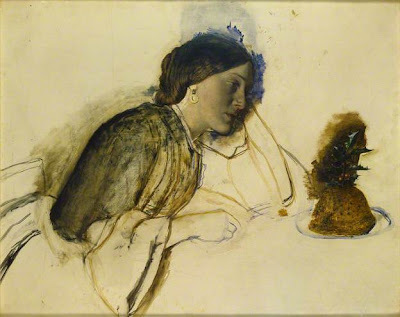 As her daughter Marakita fled the burning house, all she managed to grab was a drawing by Rossetti and four small paintings by Henry. The rest was lost. 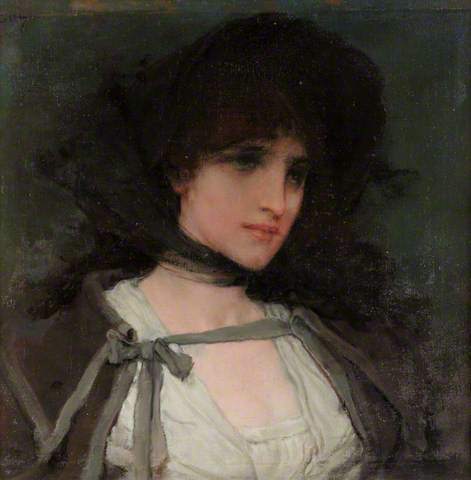 Joanna's legacy to the world of art, her chances to be rediscovered by feminist art historians in the same way as other Victorian lady painters would be in the 1960s was all but lost in that one night. Reading the story of the brother and sister, it is really a story of contrasts. 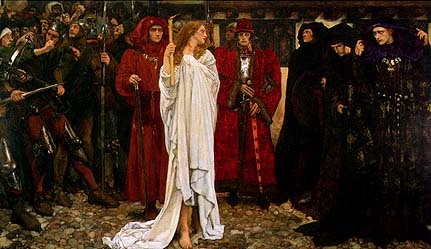 As George moved easily into the world of the Pre-Raphaelites, Joanna was mostly forced to the boundaries. She was gifted and full of conviction. She recorded Turners death in her diary and attended the funeral with her father and brother, standing among the RAs and ARAs that would not allow her in to their club. Joanna produced work of a high standard, but the society of the day never gave her as much time as her brother, as Ruskin said 'women were natural imitators but poor inventors'. Thanks Ruskin. Henry also moved with ease into the circles of fashionable artists. He took classes with Rossetti and no doubt met George in the Pre-Raphaelite society that they both moved. It is very interesting reading about Joanna and George's widowed mother, who seems to have held great sway over her children's marriages and at first put up resistance to Joanna and Henry's engagement, as she did with her other children's attachments. Makes you wonder if that is the reason for George's many and varied flings, with Fanny Cornforth, Ellen Smith, Alexa Wilding, Annie Miller and so on and so on. George seems to have spent a goodly amount of his time 'desperately in love' with some girl or other but never stuck around to get serious. Saucy devil. It was his sister's marriage to his friend that signaled a divergence of the paths for the three. 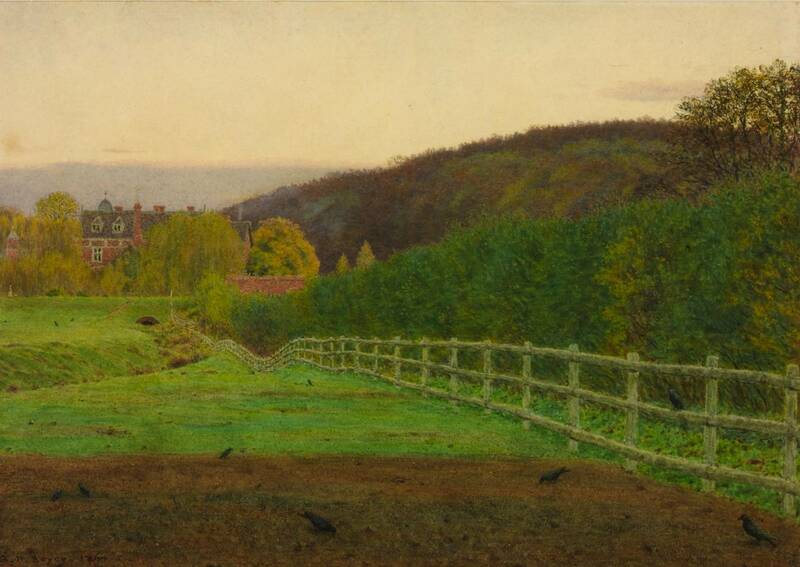 George grew closer to his Pre-Raphaelite 'family' as his reputation as a landscape artist and a collector of art grew. In Joanna's letters there is an attempt to get her brother to visit, to be close again with the couple like he had been before, but George was as slippery as an eel, preferring his freedom in the society of his fellow artists (and their models, if you know what I mean). There is a very interesting notion put forward in the book that Rossetti acquired Boyce's landscapes to use in his own work, as he detested working outside and so turned to Boyce's art for the scenery he required for his own. 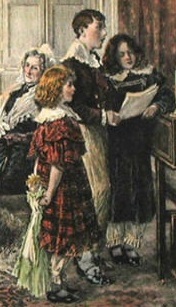 The family was reunited by the death of Joanna and George's younger brother Robert in 1859, and it was not a moment too soon. George was exuberant at the birth of his sister's first child, Sidney, the same year, followed in 1860 by Alice (who would be the 80 year old lady in Bath), but in 1861, after the birth of another daughter, she became seriously ill and died, almost exactly two years after her brother. 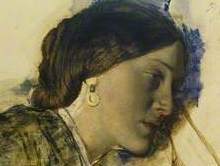 Rossetti was summoned by his friends, the brother and husband of Joanna to record her on her deathbed. 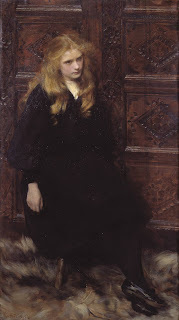 In death, finally, Joanna became valued by her contemporaries who flocked to her studio and declared her work brilliant. It is interesting that after Joanna's death, the focus of the men in her life seems to shake and their fortunes, while good, are damaged for the lack of her. 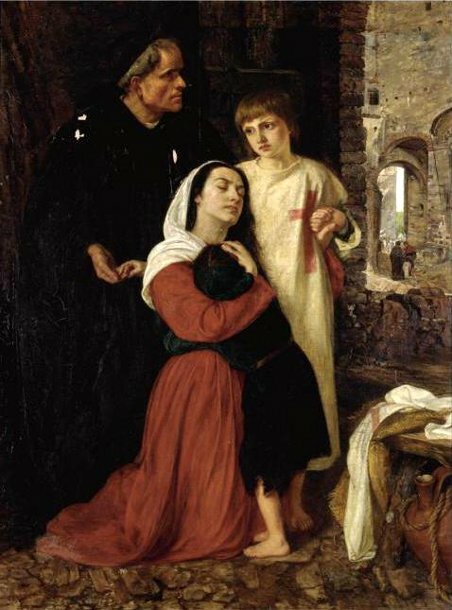 Henry found success as a portrait painter, although his life was again shattered in 1869 by the death of his only son, Sidney, to scarlet fever. He continued to work, certain in the knowledge that one day his wife would be honoured as the great artist she was. 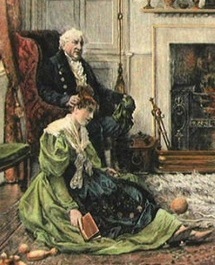 George finally fell, almost accidentally, into marriage with Caroline Soubeiran, and his diary ended. 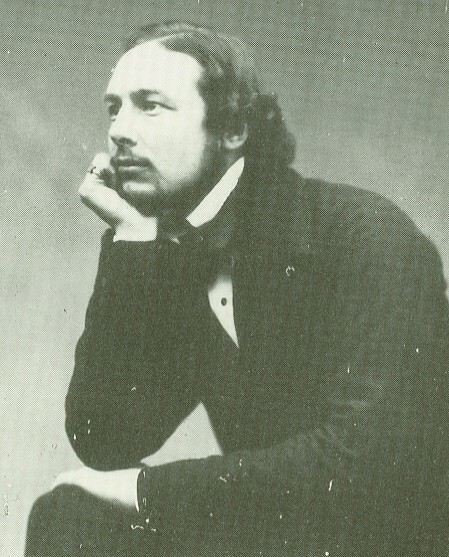 His friendship with Rossetti petered out, due to Rossetti's illness and, much to Boyce's regret, the two never saw each other again after 1877, although he travelled to the grave in Birchington to pay his respects to his friend. He continued his air-painting of his beloved wife until his strength finally gave way and he died, his painting complete. What this touching and fascinating book offers is a chance to see a family on the edge of a scene we are familiar with, and their story is both odd and typical, with love lost, family together and apart, and a powerful love of art that compelled three extraordinary lives. I was left feeling that for one reason or another none of them truly found the recognition they deserved, and sadly, especially for Joanna, that may never be so. I can thoroughly recommend this book, if only for the chance to see many of Joanna's paintings illustrated from photographs mercifully taken before the 1940s. If we are to honour Joanna Boyce Wells in the manner her husband always dreamed of, we have to start somewhere, and this is a compelling account of a talent woman. Well, my darlings, I hope you all have a happy Christmas and thank you for your many comments and emails over this Blogvent. I hope all your puddings are bigger than your holly, your muffs are toasty and that you all get a chair. Today is the penultimate day of Blogvent, and I have been out and about all day on Christmas business. I was at a Farmers Market this morning, and doing some shocking shopping this afternoon, finally getting hold of little bottles to decant my home-made sloe gin into. The weather has been clement, thank goodness, and we got a surprising amount done, which means tomorrow I can stay at home baking. So what image have I chosen for my last-but-one blogvent post? There are a couple of questions I have about this picture. Firstly, why do the orphans stand in the snow and 'busk' while their clothes seem to be of quite good quality? 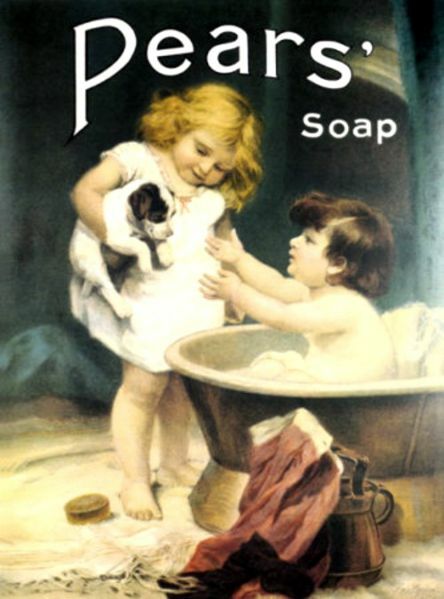 Both are spick and span and clean, so although they are orphans, they are rather well kept. The little girl in the red tights has a very classy shawl wrapped around her, and both are wearing neat little hats. Yes, I need to mention the harp. Where in God's name did they get hold of a harp? Plus, when you go busking in the snow, you don't usually drag a giant musical instrument with you. The damn thing is bigger than both kids, and not exactly portable in the snow. Mind you, it does give you a bit of an edge in the busking stakes. It beats a guitar hands down. Okay, so we'll assume that those two moppets didn't drag the harp into the street to play a couple of choruses of 'Roll Out the Barrel'. Maybe it's meant to be symbolic - those two are actually angels, unnoticed in the human world, even with a ruddy big harp. They don't appear to be asking for money, there is no hat or bowl for the money. 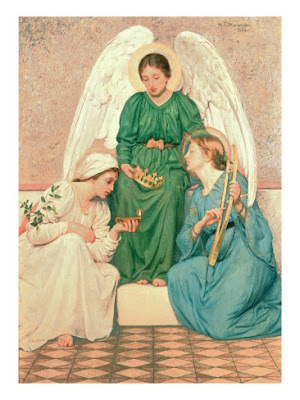 Usually if you see some innocent young 'un with a harp, she tends to be a celestial being, like the lady in blue, above. There is something unreal and cloud-like about the background, as if the two are in heaven, all misty and, well, like you'd expect. When I first saw the image I thought it was unfinished, but then I noticed the little buried branch behind the girls, and realised that they are the point of vivid clarity in the sea of swirling snow. 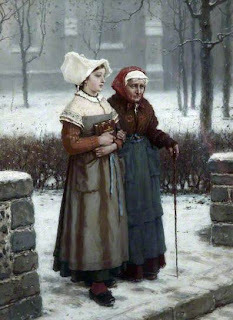 The pair of them stand out so clearly, the pink of the shawl, the red tights, the shine of the wood, and all around them is a powder screen, a world under a blanket of Winter. Their expressions are oddly blank, or introspective, fixed on some inner point. 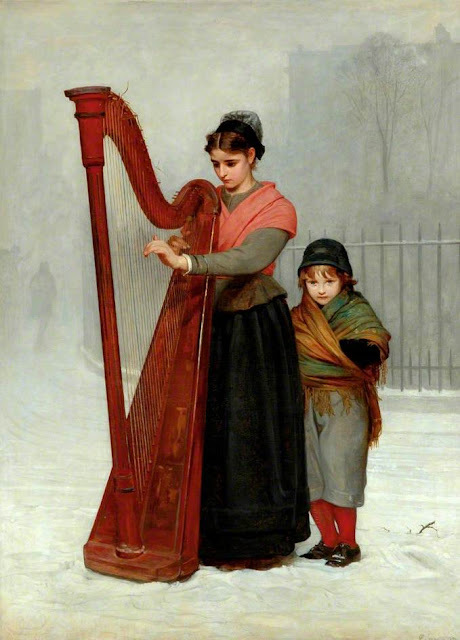 They are orphans, so possibly they are thinking of their parents, and maybe it's something about the harp that brings their memories back as clear as they are in front of us. Christmas is a time to remember, a time for recollection so strong that you lose any notion of the present as you wander lost in the landscape of the past. Winter is the season of reminiscence, of settling to some memory of times before. Each item of Christmas holds a bundle of history, it becomes impossible not to remember people no longer with us as I unwrap our tree ornaments, gathered over many years. I go through rituals with Lily that my own mother went through with me, I cook the same food, sing the same songs, plan the same time spent alone and with friends and family. I watch the same films, bake croissants, drive the plastic stakes of little plastic robins into the Christmas cake which I cook and ice with royal icing, hard and crisp as snow. Christmas is a time of repetition, made bittersweet by absence, when you become the person who taught you the rituals, and you in turn pass them down to the person will one day feel your absence as she too passes them down. Ah, that's better. Well, I say 'better', but possibly I mean 'unexpectedly harsh'. I don't remember seeing this young lady at the party, but she has obviously been having far too much fun and now has to pay for it. It is her 'penance' to have to walk barefoot in the snow, in her nightie carrying her baby. I like the fact that she gets a candle, because we don't want her to get lost as she freezes to death. Mind you, possibly the purpose of the candle is not so she can see, but so we can see her in her shame. Most Penitents tend to be women in paintings (if they are not Dr Johnson) and there does seem to be a sexual element to the sin they have committed. Yes, Eleanor is punished for her necromancy, but I don't think the fact that she is a mistress, and a bit of a saucy piece is doing her any favours. 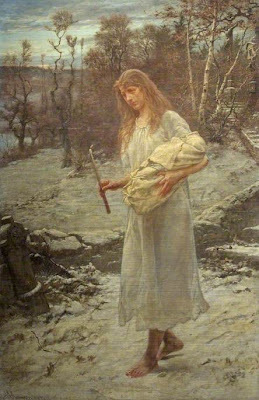 Likewise, why on earth would they make our penitent girl in the snow carry her baby with her if it wasn't somehow connected to the 'sin' she had committed in order to receive the penance? It seems astonishingly inhumane to make someone walk barefoot, let alone expose a baby to the winter, but somehow this made sense to people as suitable punishment. Welcome to the shortest day of the year, and the longest night (she says, with a raised eyebrow). Yes, I know, it was also meant to be the end of the world, but as it turned out, the world didn't end and so we're having a little celebration this evening as school has finished and neither Mr Walker or I have to be in work again until next year. Hurrah! Swedish cider all round! A glorious painting, this was one of our Christmas stamps a couple of years back and it remains one of my favourite Christmas images as it is so damn fine. 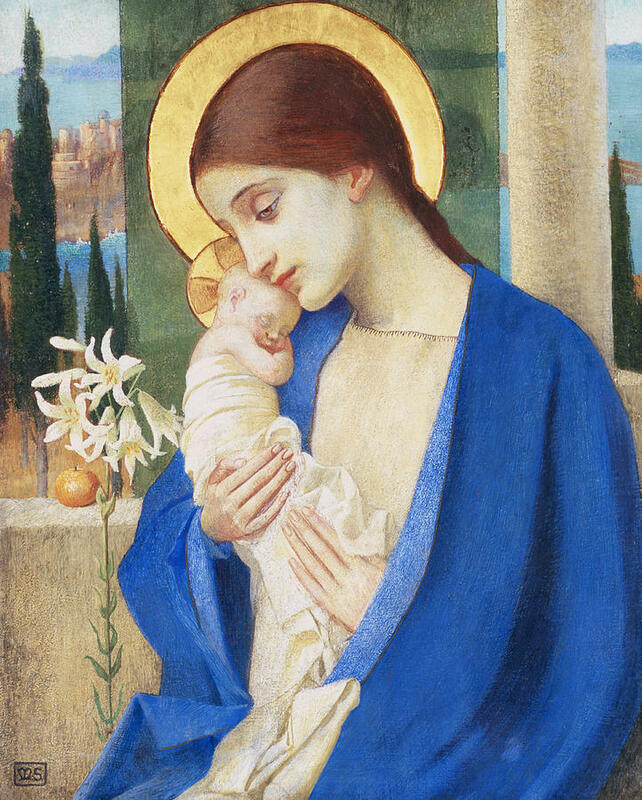 There is something so striking about the dark midnight blue, the gold and the vivid red which is so commanding, yet the expression on Mary's face is so calm. 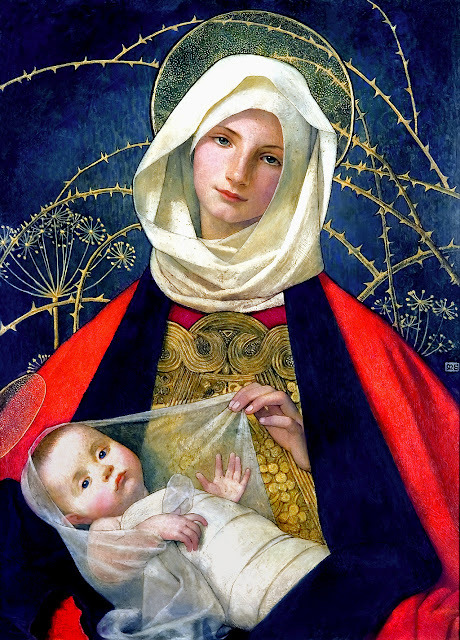 She manages to juxtapose the pale child with the hard strands of thorns, adding drama to the image, and there is something slightly shroud-like about the swaddling around Jesus, but they both look unconcerned as if they know what is ahead and that it will be alright. I love this picture as it is a realistic depiction of motherhood, in that I was often found slumped somewhere exhausted. Often in a shed. 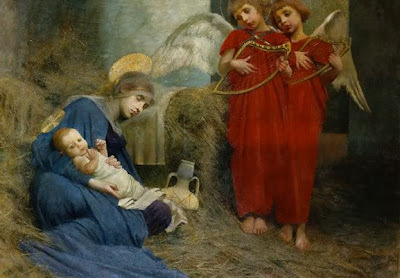 The angels are strumming away and the baby looks happy enough, but it is Mary, sound off against some hay that makes me smile. I hope they don't wake her up, mind you, if she's anything like me she won't stir until a cow steps on her foot. We're getting awfully close to the big day now, and it's nice to see such striking images of the main event, if you will. Marianne Stokes gives us a Madonna who is vivid and beautiful, a Madonna who is pale and untouchable, and a Madonna who is asleep. That just about covers it. I'm off to celebrate the end of term and I shall see you tomorrow! Yes, it's a little rough, but it reeks of Pre-Raphaelite. 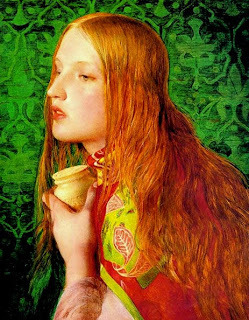 She could almost be one of Rossetti's fair damozels from the 1850s. Snow Girl isn't Pre-Raph, but she is perfection with her giant brooch and fur trimmed clothes. 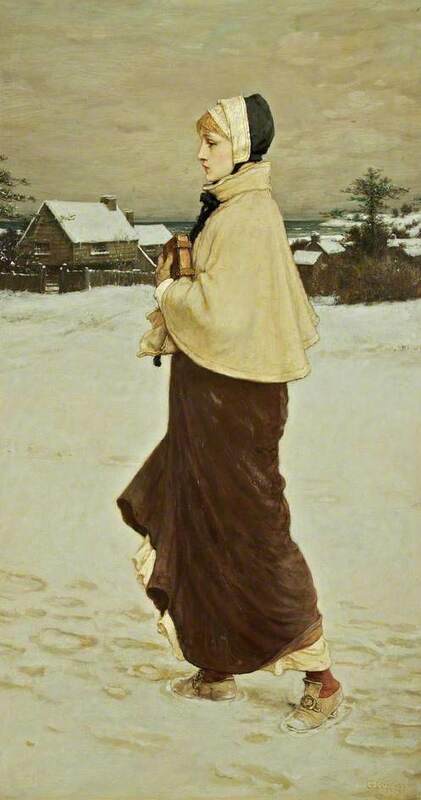 The snow is definitely a secondary concern in this image, the woman and her beauty is all that is important. The Lady of the Snows sounds a bit religious - Mr Walker points out that 'Lady of the Snows' sounds a bit like 'Lady of Sorrows', or the Virgin Mary as she is more commonly known. I'm not making any great claim for the saintly nature of Snow Girl, but it's obvious that Boughton thought a lot of her, giving her status and dignity. 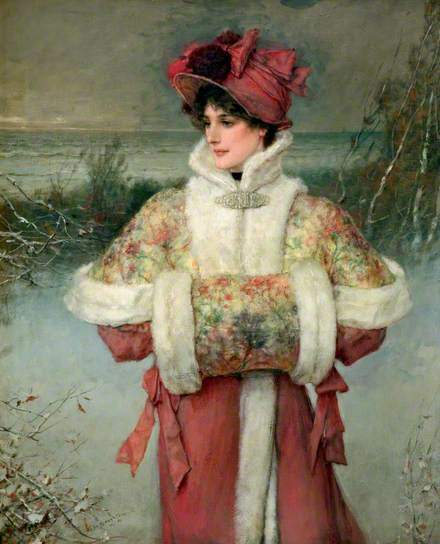 It might be cold and a bit bleak in the windswept landscape but she is unflappable and toasty in her exquisite ensemble. Well, the snow may arrive one day and I may well have the chance to look presentable again, but until the rain stops I'm not ruining my muff and bonnet for nothing. Haven't we all at some point looked inside our cracker and thought 'oh...' in a sad way? I get very disappointed over crackers, why are they always such utter rubbish?! I should make my own, at least I am guaranteed something that won't choke the dog/daughter or be utterly useless. I also think if I spent a bit more I would get a better class of cracker. There are times when I have been pleased to see the fortune telling fish, because at least that is mildly entertaining. Mind you, looking at this young lady, I think her cracker is empty. Now that is disappointing. 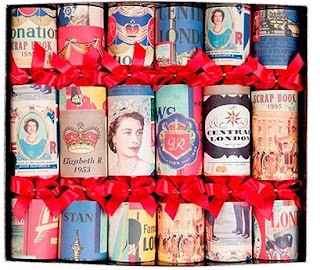 These are the 'London Superior Crackers' from Liberty and they cost £45. I would hope for more than a bad joke and a naff hairclip inside them. 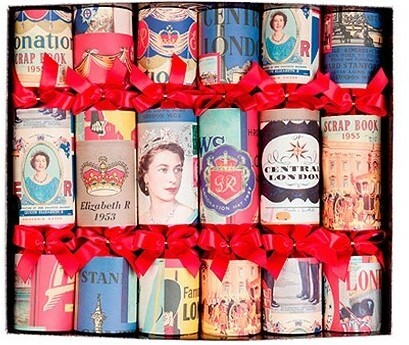 They are some of the most beautiful crackers I have ever seen and I'm not sure I would want to pull them. I'd rather just sit and look at them, but then I am a sucker for a bit of vintage. Back to Mr Grossmith and his disappointing cracker. Weedon, or Walter Weedon, was the brother of George Grossmith, D'Oyly Carte star, and together they wrote the book The Diary of a Nobody. Weedon had many and various careers, first as a painter, but then when that didn't pay, he moved to the stage and became a successful actor. I like Such is Life because it makes me think about how easy it is to feel ungrateful and disappointed during a time of such utter riches. Something inside us becomes a child again, unappreciative of the bounty that surrounds us over the Christmas celebrations until small disappointments seem to overshadow the dazzling wealth of pleasures surrounding us. 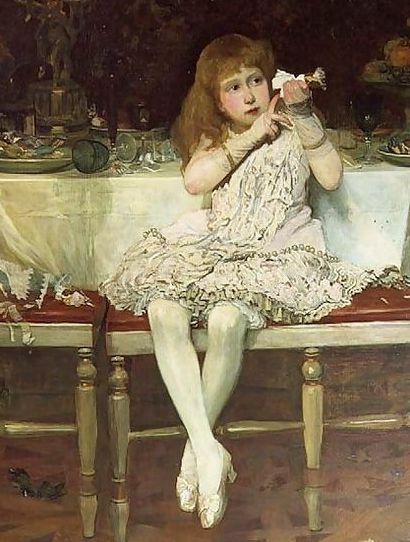 Like the little girl who ignores the glorious table full of the debris of a fabulous meal to examine the inside of her cracker, we tend to leave our blessings unnoticed to feel cheated by something that doesn't really matter. Life isn't an empty cracker, it's the overlooked good fortune. I have woken up this morning and found I have the lergy. Alas,I am mildly unwell! I have a slight cold and may well be a little bit ill! I am wrapped in a blanket, watching rubbish telly and typing, feeling a bit sorry for myself, but I'm sure it will pass, probably by this afternoon. Anyway, on with blogvent, we're down to the last week! When I saved this picture to my computer, I thought it looked like a straightforward, pretty picture of a Victorian Christmas family. 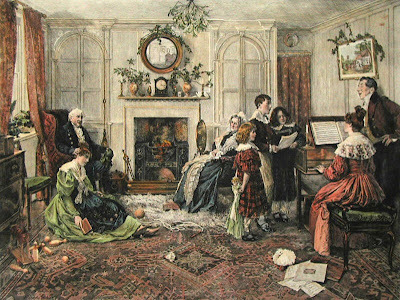 It was one of Sadler's most popular pictures, sold as an engraving under two titles: Christmas Carols or Home Sweet Home. It is definitely pushing the domestic bliss of a decent family, three generations enjoying the simple pleasures of singing at Christmas. But is there more going on, or have I taken too much Night Nurse...? Let's have a look at the different elements. Well, to start with it has a rather odd composition, with no centre, the figures dispersed across the scene. Grandma and Grandpa sit in the armchairs, while Mum and Dad are at the piano and their munchkins are singing their little hearts out. So far, so typical and normal, but then who's this? Sat at Grandpa's feet is another woman, about the same age as the Mother of the children. At first glance I thought she was an older child, but she is of an age with the woman at the piano, so I'm guessing she is the other child of Grandpa and Grandma. She is auntie to the singing cherubs, how lovely. Or is it? All around her on the floor is debris, things not wanted, things left over. Music that isn't being used, wool that isn't being knitted, a game that is over: all these things could indicate that Auntie is leftover, extra to the main event, but look at the skittles. One skittle remains upright, one skittle is standing, refusing to be knocked over. All the doors in the room are closed, the mirror reflects back nothing much, no way out, and Auntie has her back to the window, the only source of light. Yet that one lone skittle, standing despite the onslaught gives me hope for Auntie. She is at odds to the traditional bastions of Victorian domestic continuity, but there she is. Maybe she hasn't done what the parents wanted her to do, maybe she is a bit different, but she exists and she is reading. 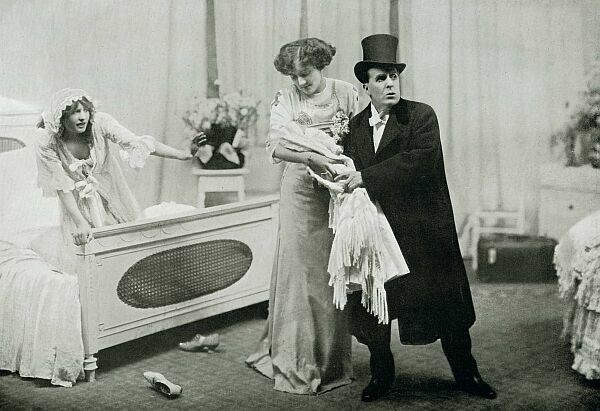 Spinsters didn't exactly get good press in Victorian England (Miss Havisham, anyone?) and the woman sat on the floor isn't exactly being given equal billing in the celebrations, the mistletoe way out of her reach, high up on the ceiling. I hope Santa brings her a chair and a comfy pillow. And some more books. And some earmuffs so she doesn't have to listen to the Moppet chorus while she is trying to read. And I hope no-one asks her to play Old Maid. Now, I'm not really a big fan of landscapes, I like pictures with people in them as I am a devil for human interest, but this has such clarity and realism that I am won over. 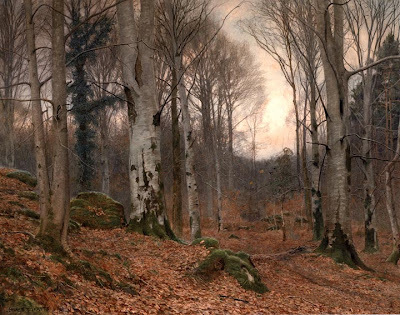 I went to the Pre-Raphaelite Landscape exhibition a few years back and was somewhat skeptical of the whole concept, but it's hard to deny that when an artist with Pre-Raphaelite leanings turns his eyes to the natural world, magic happens. The half-light between day and night, at either end of the day, is my favourite time. When there is light but no sun, a type of wonderment occurs and the landscape takes on a sort of change. 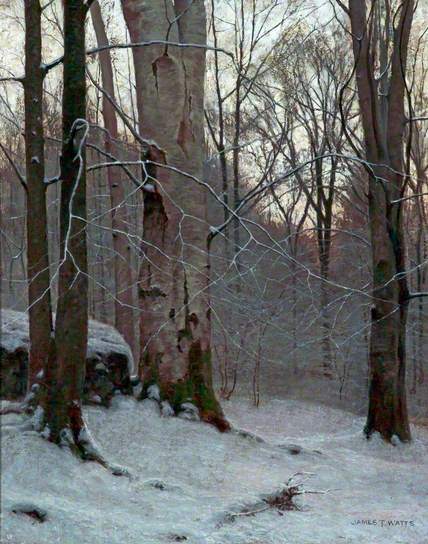 The snow tinged with the colours of the sunset seems perversely warm, and the bark of the silver birch seems to be pink like skin, in that mythic manner of beautiful women turned to trees. 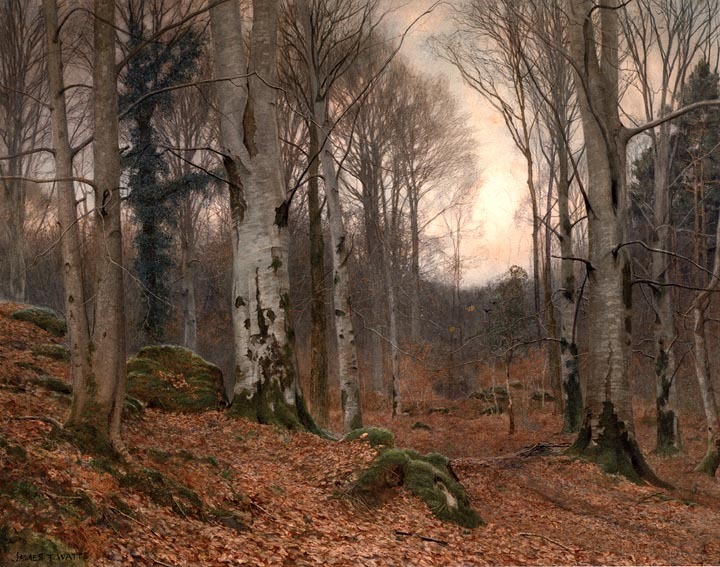 Anything might happen in these surroundings, anything may arrive in the hush of the muffled, snow-draped clearing, from a rabbit to a fairy, a deer to a centaur. 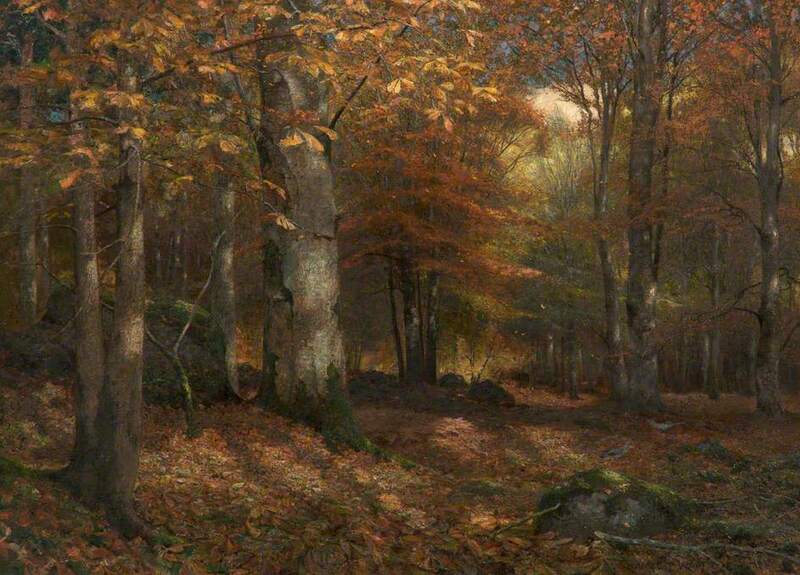 He did a good tree, did James Thomas Watts, and extended his repertoire to not only Winter, but also Autumn! Easy now, that's quite enough tree-excitement for one day. 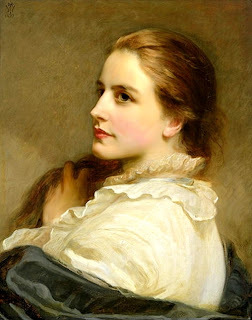 James Thomas Watts was born on 28 December 1849 in Birmingham and studied at the Birmingham School of Art, and his work has connections to Birmingham, Liverpool and Newlyn. He seems to have been very prolific over his many years of painting (he died in 1930) and did not only these splendid landscapes (and many many more like them) but also so works based on Shakespeare. 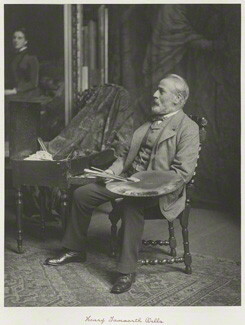 He was married to Louisa Margaret Watts, also a landscape artist of a more impressionistic style. The walls of their home did not lack for trees, I bet you. 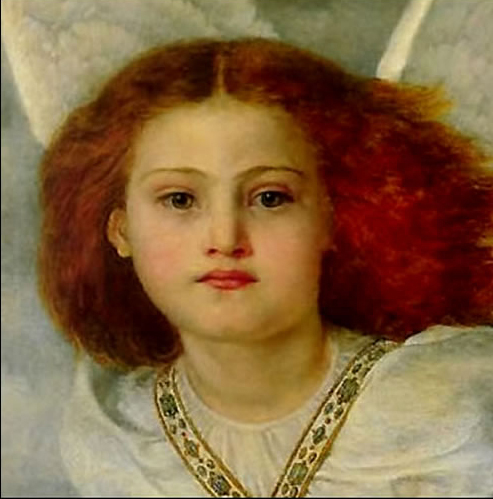 Okay, so she is a little cherubic, but the detail is so exquisite I am willing to forgive. Look at the sheen on her little slippers! I am quite taken with the holly on her beret, I may try that, it looks quite swish and yet festive. Yes, Ralph Peacock is a man whom I trust with Christmas. Mind you, looking at his other work, I'm astounded he isn't better known. Peacock trained at the St John's Wood Art School and knew other artists of his time like Herbert Draper and J W Godward. 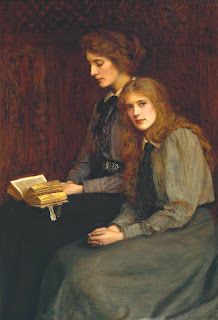 He used the famous model Mary Lloyd (I think I need to write about her after blogvent), used by Leighton and Alma Tadema, and two of his works, Ethel and The Sisters are owned by the Tate. Yet, this is possibly the first time I've used him in my blog, and when I found the Christmas image, I did not recognise his name. How awful for poor Mr Peacock! If you look at his Christmas Lass above, he has managed to find a 'hook' for the piece that I have not seen anywhere else, the notion that her clothes are special, that they are 'Christmas clothes'. I'm sure it is taken for granted in other images that children, and possibly adults, would be wearing their finest clothes for the family celebrations. However, the contained excitement and pride on Peacock's girl's face makes you think that the whole point of this moment for her is her new finery, down to those shiny silk slippers. 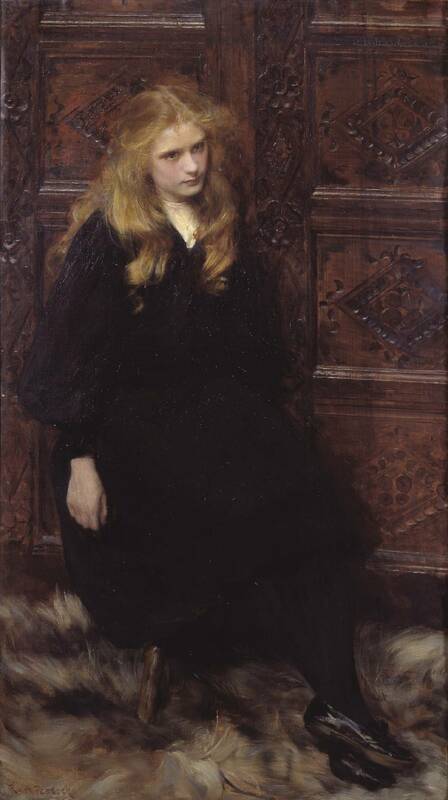 When I first saw the Girl in Christmas Clothes I thought she might have been by Millais, but then she wasn't cloying enough. If you look at this similar image by good old Johnny, the colours are striking and the child is suitably solemn, but I think Peacock brings a welcome sharpness to his image, a clarity in light and coolness of tone that raises it above the 'ah, bless her' pictures of children Millais seemed to turn out. I now have to go away and see if all of Ralph Peacock's models have carved wood behind them, he does do a nice bit of carved wood. This picture does raise a very interesting issue though - what am I going to wear on Christmas morning? If we were Christmas-ing alone, then it wouldn't be too bad and I could remain in my pyjamas all day. Mind you, there are a lot of photographs taken at Christmas, so I'm not sure I'd want it recorded that I didn't get dressed all day and just sat around in a onesie necking Harvey's Copper Beech. I don't own a onesie, just for the record, but you get the idea. Christmas clothes are like a uniform you don for all the enforced excitement and merriment you are about to do and rarely do they have elasticated waistbands, which should be compulsory, because heaven knows you'll need one. Yes, I did knit them myself. So, now I am sat in my very festive home, writing another blogvent entry, in full knowledge that in 9 days time it will be Christmas Eve! How time flies when you're breathing in copious amounts of brandy! 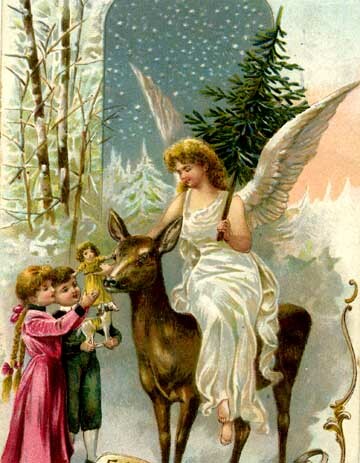 Anyway, while I am in such a jovial mood, let me bring possibly the most horrendous Christmas related image so far. Heavens, how awful. 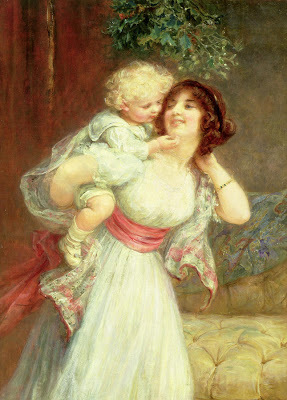 A jolly mother carries her blonde, chubby-kneed child on her back, while they both laugh with the jolly high-spirited wonderment of it all. 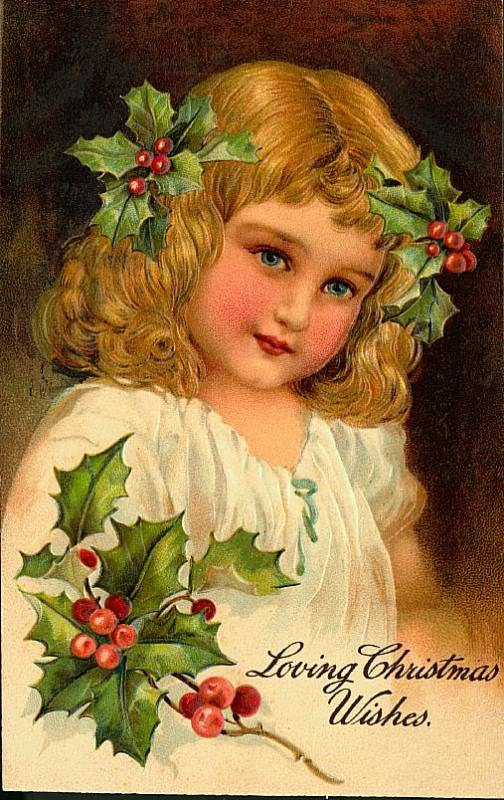 She has paused beneath the mistletoe to no doubt kiss her cherubic little bumpkin because it is all so damn marvellous. Oh yes, this is a brutally realistic image of motherhood. Mind you, I'm in the image above it wearing a deer hat that matches my daughter's, so possibly I'm in no position to judge. Most children in our Western society will recognise the jolly old man in the picture and will believe with fervent passion that he exists (and possibly that he drinks Coca Cola). 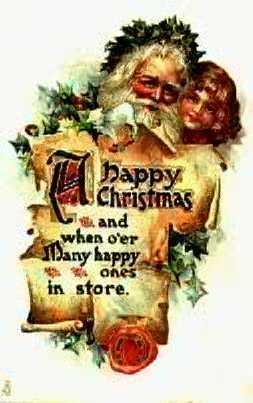 The Victorians linked children with Christmas because without hesitation children believed that the white-bearded man would bring them gifts if they had been good. Never mind all that 'saviour born in a manger' business, far more alive to them was a 4th century saint who filled their rooms with gifts, who actively expected good, 'Christian' behaviour on a yearly basis, and he would be grading the exam. None of that 'getting your reward/punishment when you die' malarky that adults believed in, Father Christmas was marking you as you went along, and if you were naughty, it wouldn't be burning in Hell you had to worry about. It was far worse: no presents. 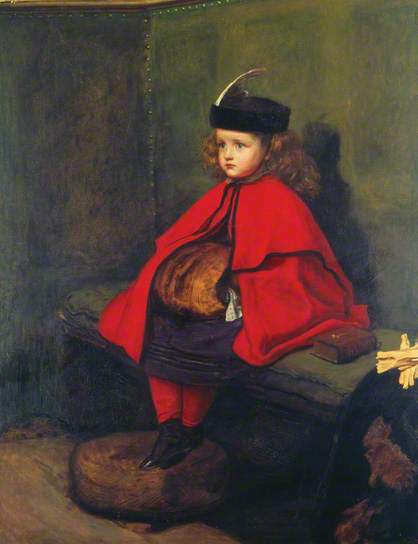 When looked at like that, possibly the Victorian obsession with children and Christmas was a sort of jealousy. Children understood the notion of being rewarded for good behaviour in a very simple way and the magic of seeing their conduct rewarded was celebrated. How much simpler, how much more delightful than having to be an adult, knowing that the presents didn't just appear, the bounty of good behaviour. I can't remember when I realised that Father Christmas didn't actually deliver the presents, possibly many years before my parents stopped sneaking into my room to fill a pillowcase with gifts in the middle of the night, but the magic of closing my eyes to no presents and opening them up to a heap of treasure is still vivid in my memory. But would children enjoy Christmas less if they didn't believe a red-suited man broke into their house every year to leave them presents, if it was just their parents who gave them gifts? What Frederick Morgan's ecstatic mother could be so happy about is the vicarious pleasure of innocence and belief. The child is delighted because everything is good, about as good as it could be, because he is loved and a magical being is about to reward him for his perceived good behaviour (we all know that behaviour has no bearing on the presents at all). Just as the toys reflect adult concerns (a doll standing in for a baby, toy houses, toy trains, toy weapons) then the belief system of Christmas is the junior version of Christianity. If you believe in the coming and returning of the man, he will return and reward you. Year after year he returns to reward the good, the kind, the believers, and, notionally at least, to punish the bad with no gifts. It is heaven and hell with shiny ribbons on top and it doesn't matter if you get it wrong one year as there is always a chance to change your ways and get it right next year. Santa doesn't hold a grudge, and his memory is only as long as a year. Learn your lesson and get on the 'Nice' list early, if you know what I mean. 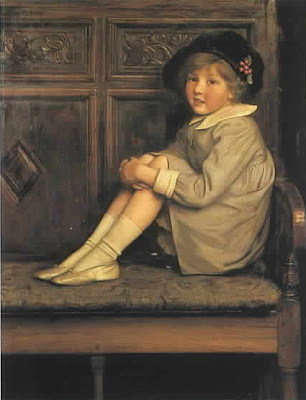 Well maybe, after all that, Frederick Morgan is just enamored with the cloying loveliness of children and pretty women in white frilly dresses, Lord knows he wouldn't be the first one. But just for a moment, dear readers, have a little dream that somewhere a man of mythic status, dressed in robes of red or green, trimmed in exuberant white fur that mirrors his long flowing beard, is loading up his sleigh, harnessed to large, beautiful flying reindeers who cloud the frost-ringed air with their patient breaths. And on his list is you. Yes, that's more like it! Full of giant swans and graceful swathes of Grecian drapery, as you toot in Winter with your, what's that? Is it a flageolet? Is it a extra-long trumpet-y thing? I'm going with 'tooty horn', although that doesn't quite have the dignified ring I was aiming for. Anyhow, here we have a lovely woman, heralding in the coming of Winter, in the form of a white sweep of swans. I never really considered the swan as the bird of Winter, I think I would have gone with a goose, but they seem to crop up regularly. I wonder why...? 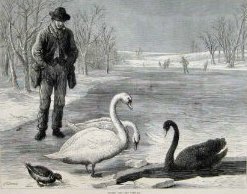 Not only do you have George Dunlop Leslie's Frozen Out ( as we saw here) but there are also Seven Swans A-Swimming in the 12 Days of Christmas. The size and undoubted deliciousness of Swans probably made them a desirable Christmas dinner, so even when they fell off the menu they probably still represent the bounty and indulgence of a Winter feast. 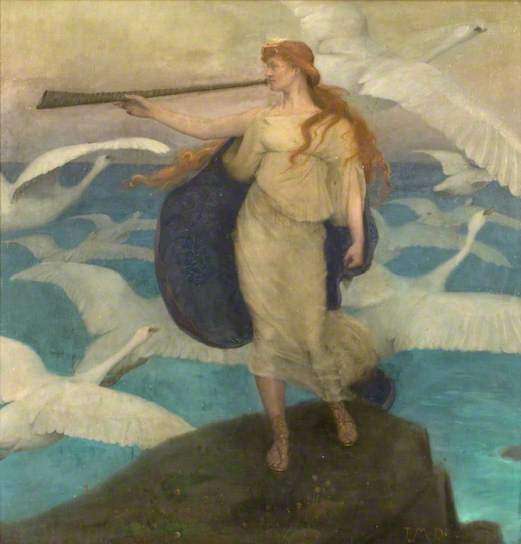 Maybe the lady trumpets the coming of Winter with swans because the meaning of the word 'swan' is 'to sing'. Although of all singing birds, swans are not the first that spring to mind. Their name is from the notion that they trumpet their song, to the point where one of the species of swan is called 'Mute' because they don't sing as much. The phrase 'swan song' comes from the idea that male swans sing before dying. Possibly that is also a clue to the picture. If the swan's song is synonymous with ending, maybe the swan's affinity with winter is because it is the 'death' of the year. The woman plays a long, swan-necked trumpet, singing in the end of the year as the swans, possibly her sisters that she will join, fly away. The year is ending in a flurry of white, their wings filling the sky like snow, and the song heralds the death of the old year. There is also a hint of transformation in the figure of a swan, from the girls in fairytales to the ugly duckling, so possibly in their 'death', and the death of the year, will come the birth of a new year, the hatching of swanlings (I prefer that to cygnet as it sounds sweeter) will announce the Spring and the renewal of life.